“From 1854 onward a yearly market shall be held in Røros, commencing the second to last Tuesday in the month of February, and lasting until the following Friday,” declared the King of Norway. And when the king speaks, Norwegians listen. In February 1854, Rørosmartnan was born. Traders from all over Norway and parts of Sweden harnessed their horses to sleighs and traveled across frozen lakes and rivers through snow-blanketed forests to Røros. They brought with them products indigenous to their regions to trade with their fellow countrymen. Rørosmartnan continues today and except for the extension of the festival through Saturday and the addition of electricity and cell phones, not much has changed. 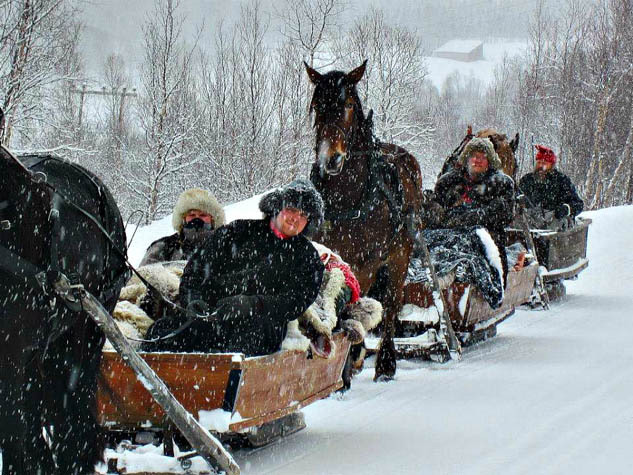 For many Norwegians, the journey to Rørosmartnan is still made by horse and sleigh with some traveling up to 11 days and sleeping in farmhouses along the way. The tradition isn’t just for old-timers—it’s a multi-generational experience with participants ranging in age from 1 to 90. The town of Røros is an attraction in its own right especially in winter when the streets are covered in snow and the sun reflects off icy tree branches. A UNESCO World Heritage site, the former copper mining town’s modern day inhabitants live and work in protected wooden buildings dressed in shades of red, brown, gold and green. During Rørosmartnan the 5,000 residents share their narrow streets with 75,000 visitors as this charming town transforms into a lively marketplace with festive street life day and night. Opening day at Rørosmartnan is a bit like time travel. The horse and sleigh teams glide into town wearing traditional Norwegian dress bundled up in reindeer furs. Strolling amid the charming 17th century wooden houses – many of which still retain their dark pitch-log facades – while listening to the clanging of the bells from the parade of horses and sleighs was a magical moment…even if it was 10 degrees. Most of the fair takes place in the two main streets where 250 exhibitors display traditional crafts, foods and regional wares. But for the true essence of Rørosmartnan, head to the courtyards known as backyards. Traditionally, people gathered in the backyards to trade, play music, dance and tell stories. During Rørosmartnan, this tradition lives on as the backyards become almost like country inns with stables for visiting horses. Wander into any backyard and you will find fiddlers and other musicians, coffee brewing over an open fire, traditional crafts and story-telling. Everyone is welcome and the traders are happy to teach you the traditional folk dances. Traditional Norwegian delicacies are offered at many of the restaurants during the festival with none quite as extensive as the buffet lunch at Bergstadens Hotel. There you’ll find every imaginable type of salmon and endless varieties of herring. Platters of potatoes stand alongside trays of reindeer meat. The chef was particularly eager to share with me a rare delicacy made from cow udders—which I graciously declined. Fortunately there was a table filled with cheese that worked much better for me. There are plenty of animal encounters available during Rørosmartnan. You can mush with a team of Alaskan Huskies or take an easy ride in one of the horse drawn sleighs under the warmth of your own reindeer blanket. Just outside of the festival in a scene straight from the North Pole, excited children of all ages ride in wooden sleds pulled by reindeer on the frozen lake. The reindeer belong to a family of indigenous Sami people whose daily life revolves around reindeer herding. Their work with these fairy tale beasts is based on traditions going back many generations in the Nordic regions. Although the family’s main home is in town, they spend much of their time with their reindeer in the mountains, where they live in cabins built for herders. During the festival they bring the reindeer to town to the delight of everyone seeking a magical winter wonderland moment. If you’ve never thought of Norway as an ideal winter destination, think again. Rørosmartnan is worth every layer you have to wear. Have you ever experienced winter in Norway?